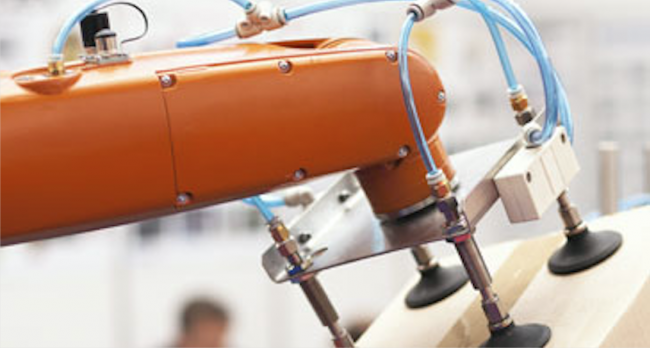 Industrial automation is on the rise, with machines performing more complicated tasks every day. Designing these complex industrial machines is a challenging process. Engineers need to ensure that the machine they design meets many different performance objectives for productivity, workspace, manoeuvrability, payload, and so on. At the same time, they also need to develop a design that will minimize both production and maintenance costs, such as using the smallest possible motors and the shortest links for robot arms, and minimizing loading to reduce the wear and tear that leads to expensive repairs and downtime. In light of so many complexities, organizations will over-engineer products, investing in more costly components to reduce unforeseen failures. Others will try to minimize costs, but are more likely to face expensive on-site repairs when unexpected failures occur. System-level modeling offers a third option, providing analysis and deep insight into product performance long before physical prototypes. • What is the proper motor sizing for the robot in all operating conditions? • What lengths should the links be to achieve the desired workspace? • What effect will different combinations of link lengths have on the design? • What is the required performance from the motor and gearbox in different use cases? The Maplesoft Engineering Solutions team applied a parametric system modeling approach to answer these questions. They used MapleSim to develop a high-fidelity parameterized model of the company’s pick-and-place robots. Then they used the advanced computation capabilities of Maple to develop analysis tools that examine the operation of the system and its dynamic behavior with different sets of parameter values. 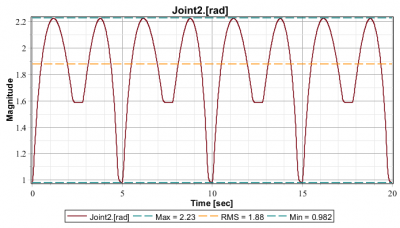 These analysis tools, together with the high-fidelity model, provided the company with the insight required to determine how to prevent their motor failures without any new additional hardware. They were able to adjust the robot’s motion profile with updated software, eliminating moments when the motors were experiencing damaging levels of torque. What had previously required regular motor replacements was reduced to a simple software update, saving the company substantial amounts of money on their entire line of robots. Further to this, Maplesoft provided them with a toolset they could easily configure for use in the design of similar products. An example of a typical pick-and-place robot is shown in Figure 1. 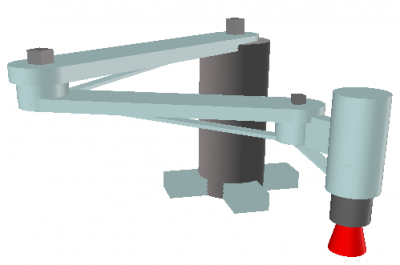 The robot model is mounted on a reference base, to which three links that form the robot arm are connected. The links are actuated by three servo motors, which provide the rotational motion and control with three degrees of freedom. The end effector consists of a translational component attached to the third link, allowing for the desired pick-and-place action. Each of the link structures includes sensor components to provide force and torque information, which can later be used to determine radial force, axial force, and bending moments at each bearing. The model also includes probes embedded at strategic locations within the design to monitor performance characteristics, such as required motor speed and torque, along with joint angle and constraints. Initial simulations were run in MapleSim to observe the behavior of the system, with the probe information presented in various plots. The model was then loaded into Maple for in-depth analysis. The Maplesoft Engineering Solutions team created a set of analysis tools in Maple to provide the company with deep insight into their design, ensuring that their product is neither over-engineered nor prone to unexpected failure. Taking advantage of the fully parametric MapleSim model and Maple’s symbolic computation engine, the tools enable the company to perform simulations across various operating conditions to determine the best combinations of design parameters. The first design tool developed by Maplesoft enabled the company to perform kinematic analysis. The kinematic analysis allowed them to check the robot’s workspace, visualize its motion, and determine any required path offsets. The robot motion is affected by whether the robot’s elbow is configured to be on the right side or the left side. One of the features of the kinematic analysis tool was to perform the inverse kinematics calculations, and evaluate for both elbow positions. By observing its behavior in both cases, the company was able to make an informed decision about which side to place the elbow – a decision which was then carried forward and applied to all further analyses. The next step was to determine whether the robot was operating within the range of allowable motion, and whether any of the joint angles were exceeding the desired limit. For each joint there were multiple variables, including joint angle, angular velocity, and angular acceleration, and these varied based on the desired path of the end effector motion. The results showed that the initial end effector design path resulted in large angular acceleration spikes, indicating that the company needed to make modifications in order to smooth out the motion used to actuate the joints. The adjustment would not only decrease the magnitude of the acceleration spikes, but would also result in reduced joint load, and reduced motor and bearing operating requirements. This insight helped prevent the unnecessary costs of over-engineered motors. While the company naturally wanted to use the smallest motors possible, they also had to ensure that the motors they selected would still meet the robot’s performance goals. The Maplesoft Engineering Solutions team developed an analysis tool to assist the company with motor sizing. The speed, torque, and energy of the motors were determined and plotted, then overlaid on the manufacturer’s performance curves for the targeted motors. The motor performance curves were selected from a list of possible motor data imported into Maple. For each of the motors, the company could then compare simulated results with data for different motors from the manufacturer’s specifications. Using the analysis tool, the company was able to consider different motor configurations capable of performing within the desired range. A similar approach of overlaying the manufacturer’s data on simulated data was taken to explore the gearbox limits and the selection of different gear ratios. Another analysis tool developed by Maplesoft was a parameter sweep to observe the effects of different link lengths on the operation of the robot. Simulating the model with different link length configurations within a pre-determined permissible range enabled the company to observe the corresponding effects on performance characteristics such as motor speed, torque, load requirements, and workspace variations. Maple automatically makes use of parallel processing, allowing the user’s computer to simultaneously run multiple simulations using different parameter values, and then presents the results overlaid in a visualization window for quick and easy comparison. By taking a system-level modeling approach, the company was able to improve their engineering processes, giving them deep insight into their product performance at an early stage of design. The company leveraged this new design process to eliminate a substantial motor replacement program, and continued to make design improvements for future cost savings across their entire robot line. The Maplesoft Engineering Solutions team developed a highly configurable solution that helped the company address challenges and unexpected costs they faced when designing industrial pick-and-place robots. Developing a fully parametric system model in MapleSim provided access to all the system parameters required to analyze and optimize the behavior of the system. Maple’s symbolic computation engine enabled the development of a wealth of analysis tools that explored the relationships between system parameters, and their effects on the overall performance. This new approach shed light on solutions the company didn’t know existed, with overall costs just a small fraction of their previous techniques for robot motor repairs. The parametric models are also being modified and used across various pick-and-place robot designs, reducing potential failures and over-engineered parts early in the design process. This case study presents just one example of innovation in the industrial automation and packaging machinery sectors. As automated robot requirements become more complex, this company realized the huge role that system-level modeling can play in driving innovation. What started as the desire to fix a simple problem has radically transformed their design process, shortening design cycles and minimizing unnecessary costs every step of the way.